Thinking about making your own custom board game box? Read this first. Sunrise Packaging has worked with a lot of unique projects over the years, but some of the most innovative and excited creators are those who make games. It’s a true passion project. And we hate to see that excitement fizzle out over some of the most common things that game makers miss or don’t consider when they design their custom game board box. On the surface, creating game board boxes isn’t an overly complicated thing. But like any packaging project, there are things to consider that an outsider might not think about beforehand. The weight of the packaging materials, for instance. The mobility of the game box. The design and print quality of the box. Not to mention the copy for the box as well. In a way, custom board game boxes aren’t unlike product launch kits in everything they need to accomplish. Things that every game maker should consider when it comes to crafting their own game board boxes. Essentially, it comes down to one thing: plan ahead. Knowing what you want to spend can help determine other options. If you want to make money on your custom game, it’s completely necessary to have a budget in mind for what you want to spend on packaging on top of the game production costs. How do you want users to interact with the packaging? Customer experience is of increasing importance. Not to mention that a great unboxing video could increase sales dramatically. 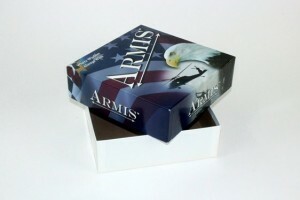 Sunrise Packaging can help craft boxes with handles and magnet closure as well as custom inserts and printed elements inside the box itself. Get creative, but keep the whimsy in check. Outlandish ideas aren’t always the most sustainable. You’re browsing online and see a interesting game. You click on it, and read the position description. Alternate scenario: Walking through a store, you see an unfamiliar product. You’re compelled to pick it up and find more about it. How do you decide whether or not to buy it? Make sure to craft content that will speak to buyers and compel them to actually purchase it, not just pick it up for a moment. Proper planning is the most important part of creating a custom board game box that will sell. These are just three things that you should consider. Making your own game packaging might seem more cost-efficient, but it’s not if you have to spend hours upon hours doing it. Leave it to the experts; we’ll leave the game making to you. Contact us today!